Shortly after the draft, the Mets hired Casey Stengel as their manager. On accepting the position, the 71-year-old Stengel said, “Most people my age are dead at the present time.” Drumming up support for his new team, he announced, “Come see my amazin' Mets!”2 and the name stuck. This first Mets team was made up of veterans at the tail end of the career and players who had toiled mostly in obscurity for their careers. Although they tended to skew old, these veterans (Roger Craig, Clem Labine, Charlie Neal, Don Zimmer, Gil Hodges, Richie Ashburn and Frank Thomas) gave the Mets a patina of respectability and likely brought many baseball fans back to the game. On April 11, 1962, the field at Busch Stadium in St. Louis was soaked at game time because of rain the previous night. Temperature at game time was 55 degrees.3 A relatively small crowd of 16,147 showed up to watch the Mets, the new kids on the block in the National League, and the always competitive Cardinals. In the first inning, the Mets went down 1-2-3 as Richie Ashburn flied out to center field, Felix Mantilla grounded out to third and Charlie Neal flied out to right field against starting pitcher Larry Jackson. The Cardinals jumped on the Mets in their half of the first. The Mets' starting pitcher was 32-year-old Roger Craig. He had been a respectable pitcher in previous years but was about to go through a painful season with the Mets. In the first inning, he gave up three consecutive hits, with third, by Stan Musial, driving in a run. Craig committed a balk when facing Ken Boyer and both runners moved into scoring position. On Boyer’s ground out to third, Bill White scored the Cardinals’ second run. The second inning was notable for the Mets' first strikeout by a pitcher, when Craig got Gene Oliver to swing at a fastball. The Cardinals went down quietly and the Mets finally got on the scoreboard in the next inning. Richie Ashburn hit a single and Jackson then walked Felix Mantilla. After Charlie Neal singled to right field, Ashburn scored and the speedy Mantilla went all the way to third base. The next batter, Frank Thomas, hit a long sacrifice fly to center field that scored Mantilla. The Mets had scored the first two runs in their history and tied the Cardinals. New York did not enjoy the excitement of tying the score for long as Craig continued to struggle on the mound. In the bottom of the third, Curt Flood led off with a single, stole second base, and later came around to score on Bill White's RBI single. Musial hammered a double to right field to score Julian Javier, but Bill White was thrown out at home on a terrific relay throw by Charlie Neal. Craig managed to get Ken Boyer to ground out to third base, but Minnie Min͂oso singled in Musial to give the Cardinals a 5-2 lead. The Mets fought back in the fourth and fifth innings. In the fourth, Gil Hodges hit the first Met home run, a solo shot off Larry Jackson. The Mets got another bases-empty homer by Charlie Neal in the fifth. Bob Moorhead, making his major-league debut, replaced Craig and pitched two scoreless innings before things fell apart for him in the sixth. The Cardinals scored four runs, three of which were unearned as a result of Mets errors. After a leadoff double by Gene Oliver, second-baseman Neal made an error on a groundball by Julio Gotay. Pitcher Jackson’s single drove in a run. Flood’s sacrifice fly drove in another and Javier’s single added yet another run. Javier stole second, advanced to third on catcher Hobie Landrith’s error and scored on Bill White’s sacrifice fly. With two outs, Musial singled to right but was thrown out at second when he tried to stretch it into a double. For all intents and purposes, the game was over at that point. Stengel replaced Moorhead with Herb Moford in the seventh inning and Clem Labine in the eighth. The Cardinals got another unearned run off Labine in the eighth. Larry Jackson went the distance for the Cardinals. New York was on the short end of an 11-4 score. For all the hoopla surrounding the Mets as they began their inaugural season, this game turned out to be a harbinger of things to come. They made three errors and their pitchers only recorded one strikeout; Craig also had a balk during his short stay on the mound. The Mets left seven runners on base and grounded into two double plays. In their home opener, the Mets lost again, 4-3, to the Pittsburgh Pirates, part of a nine-game losing streak to open the season before picking up their first win, 9-1, against Pittsburgh on April 23. The Mets continued their losing ways throughout the season. After reaching a season-best record of 12-19 on May 20, they lost 17 straight. They also had an 11-game losing streak in July and a 13-game skid in August. By season's end on September 30, the Mets had lost 120 games, won only 40, and finished 60½ games behind the pennant-winning San Francisco Giants. 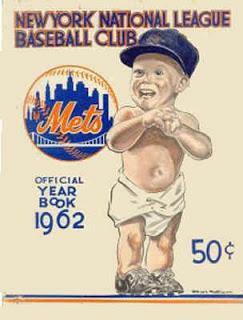 “How Bad (And Lovable) Were the 1962 Mets?” JUGS Sports. https://jugssports.com/how-bad-and-lovable-were-the-1962-mets. Accessed September 19, 2016. Kenny, Jack. “Remembering the "Amazin' Mets" of 1962.”The New American.http://www.thenewamerican.com/culture/biography/item/10976-remembering-the-amazin-mets-of-1962. Accessed September 20, 2016. Lipsyte, Robert. “Spring of ’62: Revisiting the Dawn of the Mets.” New York Times.http://www.nytimes.com/2012/02/20/sports/baseball/remembering-the-mets-first-spring-in-1962.html?_r=1. Accessed September 19, 2016. Lokker, Brian. “1962 New York Mets: The Lovable Losers.” HowTheyPlay.com. https://howtheyplay.com/team-sports/new-york-mets-first-season-1962. Accessed September 20, 2016. “Mets Club Firsts” Major League Baseball.http://newyork.mets.mlb.com/nym/history/club_firsts.jsp. Accessed September 19, 2016. “Mets Timeline” Major League Baseball.http://newyork.mets.mlb.com/nym/history/timeline1.jsp. Accessed September 19, 2016. 1. “Mets Timeline” Major League Baseball. http://newyork.mets.mlb.com/nym/history/timeline1.jsp. 2. Kenny, Jack. “Remembering the "Amazin' Mets" of 1962.”The New American.